The jasmonate-responsive transcription factor ERF189 in tobacco (Nicotiana tabacum) and its ortholog JRE4 in tomato (Solanum lycopersicum) regulate a series of biosynthetic genes involved in the nicotine and steroidal glycoalkaloid pathways. In tobacco, QUINOLINATE PHOSPHORIBOSYL TRANSFERASE 2 (NtQPT2) is regulated by ERF189; however, we found that the tomato QPT gene is not regulated by JRE4. Here, we explored whether and how NtQPT2 is regulated in a heterogenous tomato host. We used a NtQPT2 promoter-driven reporter gene to examine the cell type-specific and jasmonate-induced expression of this gene in transgenic tomato hairy roots. 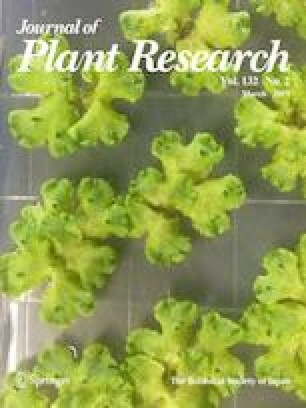 The downregulation of the reporter in the jre4 loss-of-function tomato mutant and its transactivation by JRE4 in transient expression experiments suggested that JRE4, like its ortholog ERF189 in tobacco, activates the NtQPT2 promoter in tomato. We discuss the evolution of QPT2 in the Nicotiana lineage, which mainly occurred through mutational changes in the promoter that altered the control of the functionally conserved transcription factors. The online version of this article ( https://doi.org/10.1007/s10265-018-1075-0) contains supplementary material, which is available to authorized users. We thank Ayaka Tsujii (NAIST) for the technical assistance and Dr. Yoshinori Yagi (Nagoya University) for providing the p35S-GFP vector. The tomato seeds were provided by the National BioResource Project (NBRP), MEXT, Japan. This work was supported in part by the Japan Society for the Promotion of Science (Grants-in-Aid for Scientific Research number 17K07447 to TS).